Hope this Hump day is treating you well. Since we have swiftly jumped from ice storms to scorching 30+ degree heat, it’s definitely a good idea to talk about our skin, more specifically, the skin on our beautiful faces (and probably global warming, but that’s for another day). While my level of expertise goes only as far as buying products and lathering them on my face, concluding with either a return or future repurchase, I will admit that this type of curiosity, with a dash of fearlessness, has allowed me to try a lot of products (like a lot), face masks included. Thus, if you are coming out of winter with congested, dehydrated, and just blah skin, then the following masks, their uses and tips, may be for you. Just before you dive into my mask secrets, please know that this list is based on my skin, self-diagnosed as combination (more on the drier side), hormonal acne-prone (chin and forehead-specific), and mildly sensitive, without any known allergies. Similarly, I expect you to know your skin (e.g. allergies, sensitivities, etc. ), read product labels and instructions, and consult physicians if concerns arise. Lastly, and at the very least, cleanse your face thoroughly before any mask application, and/or gently exfoliate (with this or this) for best results and effective product absorption. Oh, and the opinions are my own, and I got a lot of them, so there’s no room for those of others. Ok, little one, scroll away now. Only use it on the oiliest and most congested part of your face (e.g. T-zone for me) once or twice a week. Increase the frequency of use whenever required, as to keep the hormonal break-outs (e.g. on chin and forehead) in check. Consider the double-masking trend. Follow up with a hydrating sheet mask, as I find the process to be a bit drying, but at the same time pore-opening for the maximum absorption of any product to follow, masks and serums alike. For me, it’s simple: Combo skin, combo mask. With the help of bamboo charcoal, green tea leaves, and organic tea tree oil, the Glow Mask focuses on purifying pores and absorbing any excess oil from the T-zone, leaving the Clearing Mask, infused with detoxifying matcha green tea, as well as soothing dandelion extract and organic aloe, to remove the build-up of pollutants and impurities (caused by, ahem, the Toronto city life) from the rest of the face. Major bonus points for affordability, being 100% vegan, and leaving you with smooth and refreshed skin (almost like a minty-fresh feeling). Use the duo once a week for 10 minutes, with the application of the Glow Mask on chin, nose, and lower part of forehead, and Clearing Mask on the remaining surface of the face, all while avoiding the delicate eye area. Expect the Glow Mask to have physical exfoliation properties, as the bamboo charcoal and green tea leaves are found in larger pieces, making it a mask AND scrub in one. Double yes. Take advantage of 2/$40 deal for masks via Body Shop’s email subscription. There are over 200,000 pores on your face (ew) and concentrated more so in the centre (double ew), meaning higher chances of oil and dirt clogging up those pores (cue the birth of blackheads). Next to the extraction procedure during a facial, I find that the Bioré pore strips are by far the most effective in blackhead removal, as well as removing dirt and dead skin found on the area around the nose. Besides the immediate, gross, and oddly satisfying results, regular use has done wonders to minimizing the appearance of my pores. Use the strips once every two weeks. Application after steaming your face (add 2 drops of tea tree oil for them sinuses) or a hot shower is best, as the strip will better lock onto enlarged pores and all the gunk that is in them. Slow and towards-the-centre removal is key. Follow up with a hydrating sheet mask, as to re-hydrate the area and soothe any left-over tingling. It not only focuses on the immediate moisture replenishment, but also boosts your skin’s own abilities to retain water and naturally control its moisture balance. An angel, disguised as an employee wearing a white lab coat, suggested this mask to me when I was at my lowest skincare point, desperately looking to save my constantly dehydrated skin. What do you get when you combine Squalane, plant-based Glycerin, desert plant extracts, and Hyaluronic acid? Long-lasting hydration, as it not only focuses on the immediate moisture replenishment, but also boosts your skin’s own abilities to retain water and naturally control its moisture balance. Bonus points for affordability, light gel-like consistency, and money-saving when it comes to some of my other more expensive serums and creams. Apply a thin layer, alone (i.e. no toner, serums, etc. ), after cleansing, and as a nightly moisturizer, 3-4 nights a week. Use when more tired than usual (e.g. after a 12 hour bar shift), as it condenses your night time skincare routine to only 3 steps: remove makeup, cleanse, and mask, leaving more time to catch some much needed z’s. Don’t be alarmed by the tingling sensation during the first couple of uses, as it is simply an indication of your skin’s level of dehydration. When feeling extra dehydrated, I turn to my favourite combo of hydration compression: Garnier’s Moisture Bomb Super Hydrating Sheet Mask and Peter Thomas Roth’s Water Drench Hyaluronic Cloud Hydra-Gel Eye Patches (now, say that fast 3 times). I wholeheartedly appreciate the idea of flooding my pores and dehydration lines with intense and lightweight hydration, all while feeding collagen and caffeine to my hard-to-please under eye, as well as pomegranate extract and moisture serum to the rest of my face. Bonus points for the sheet mask actually fitting my face and staying on while I run around and try to remember where I had left my tea, so I can complete my spa-like experience. After cleansing and toning, place the eye patches under the eyes (or flip to hydrate crow’s feet) and follow with sheet mask application over them. Use combo twice a week, 20-30 minutes: once in the p.m. (e.g. Sunday), after a charcoal or any other oil pulling mask, and once in the a.m. (e.g. Friday), in anticipation of a long day and staying fresh under make-up. Place both masks in the fridge the night before use, for extra de-puffing, cooling, and invigorating effects. 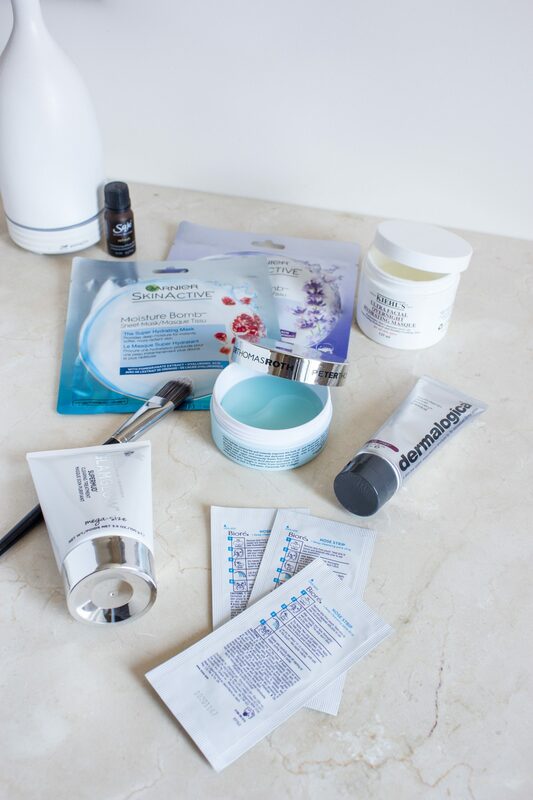 Purchase the sheet masks during a Shopper’s Drug Mart sale, as well as try using one patch on one under eye and flip the same patch for the other under eye, as to save some extra bank. While my love for Dermalogica is far from secret, my appreciation for their prevention and control philosophy shouldn’t be either. As part of their AGE Smart line, this mask, packed with concentrated vitamins, antioxidants, and botanical extracts, focuses on replenishing skin’s moisture levels, strengthening skin’s barriers and elasticity, and soothing dehydrated and distressed skin. Extra points for it being free of artificial fragrances and plumping my skin right in front of my eyes. Use it once or twice a week, with increased frequency during the winter months and after boozy, and dehydrating, nights. Double-masking technique: Apply this mask generously after the use of any charcoal-based, oil-pulling, or detoxifying masks, as to replenish any moisture loss and soothe the skin. Follow up with a vitamin C serum, such as this one, to further lock-in the firming and hydrating benefits, as well as to combo-treat the appearance of any UV damage and aging. No, YOU have a face mask addiction. There you have it, beauties. While most of you will accept this as a post introducing my favourite face masks, only a few of you will figure out that this is actually a guide on pretending that you have all you sh*t together by applying the said face masks (a form of cleansing tea included) . Sarcasm aside though, I hope you found this post interesting and informative. Until next time.